When modern American college students want to look at book reviews, they can generally turn to online databases like JSTOR that provide unparalleled access to peer-reviewed evaluations. In the nineteenth century, however, such criticism was not as easy to come across. 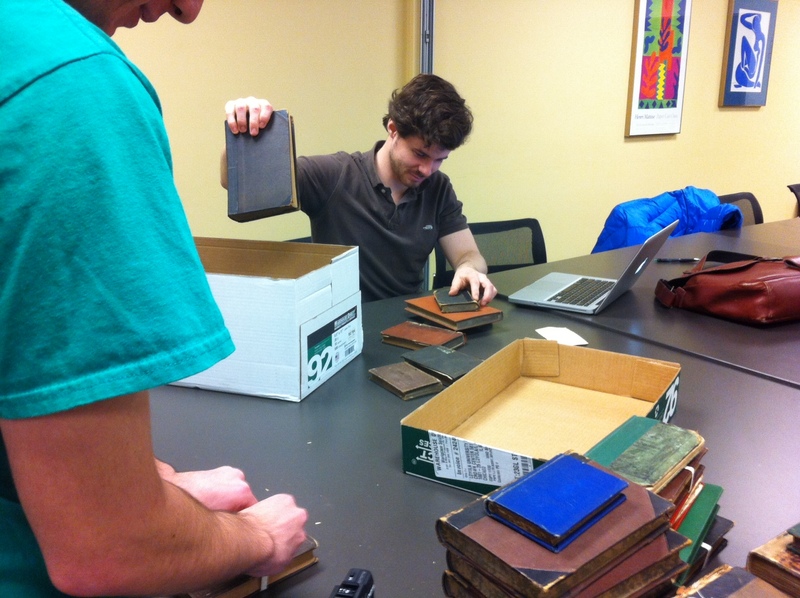 That is why one of our recent findings in the library storage facility is so intriguing. The book is called The Spirit of Popery: An Exposure of its Origin, Character, and Results, in Letters from a Father to his Children, and a St. Ignatius College student seemed to have some very strong opinions about it. 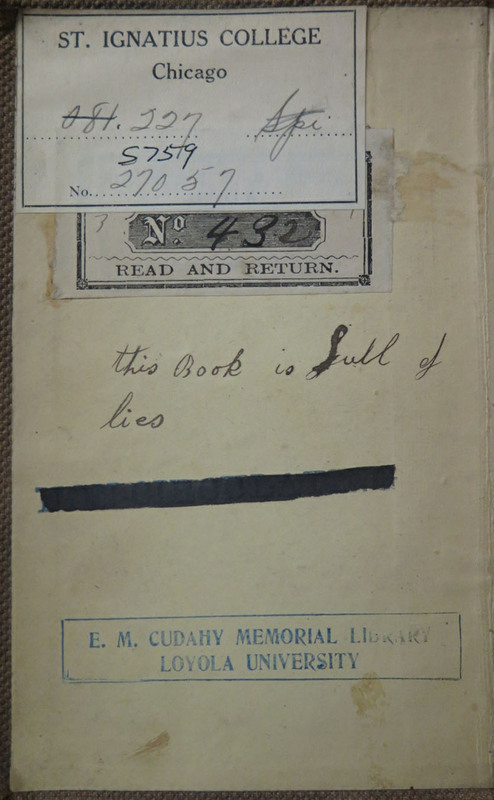 On the front pages, the student inscribed the simple yet powerful phrase “This book is full of lies” multiple times. What author could have elicited such harsh commentary? Actually, The Spirit of Popery cannot be attributed to a single author. It is one of thousands of religious tracts published and distributed by the American Tract Society into the nineteenth-century print marketplace. The American Tract Society was founded in 1825 as an amalgamation of several smaller evangelical organizations. Even in its earliest years, the Society expressed contentious opinions about popular print in the United States. Particularly abhorrent to their adherents were romance novels. One member warned, “To yield to such a hellish charm is like the voluntary sacrifice of one’s body and soul on the drunkard’s altar. Mental delirium tremens is as certain a consequence of habitual intoxication from such reading, as is that awful disease the certain end of the inebriate. Beware of it!” However, while the Society was quick to castigate what it considered sin in contemporary literature, it was equally quick to adopt print as a mechanism in its evangelical designs. Operations began on a relatively modest scale. The American Tract Society initially published and printed works on its presses, then offered them to local religious organizations at wholesale prices. By the 1840s, though, the Society became more aggressive in its distribution strategy. It was then that it began to employ colporteurs (essentially company sales representatives) to travel across the country promoting and selling their products. This strategy proved incredibly successful. Reports published every year after 1841 celebrated the sale of millions of books and the complementary dispersal of millions more. The Spirit of Popery dates to this period. Determining when The Spirit of Popery entered the American print marketplace proved a minor challenge. The St. Ignatius College copy, at the very least, does not include a publication date. It does, however, list the American Tracy Society’s address, which actually narrows down the release window to sometime past 1832. A second revelation regarding the book’s publication is that it received distribution in the United Kingdom before the United States. The Spirit of Popery was originally released by the Religious Tract Society, a British precursor to its American counterpart, in 1840. Furthermore, a review for the work first appears in the evangelical Christian Review in 1844. The reviewer praises the tract, stating, “The account of Popery, as it is, is fitted to impart to every reader, old or young, an accurate idea of the vanity of the pretensions of such a scheme to the character of a system of faith, revealed from God, and designed for the suffering and the guilty.” The St. Ignatius College student who scrutinized the same pages did not agree. 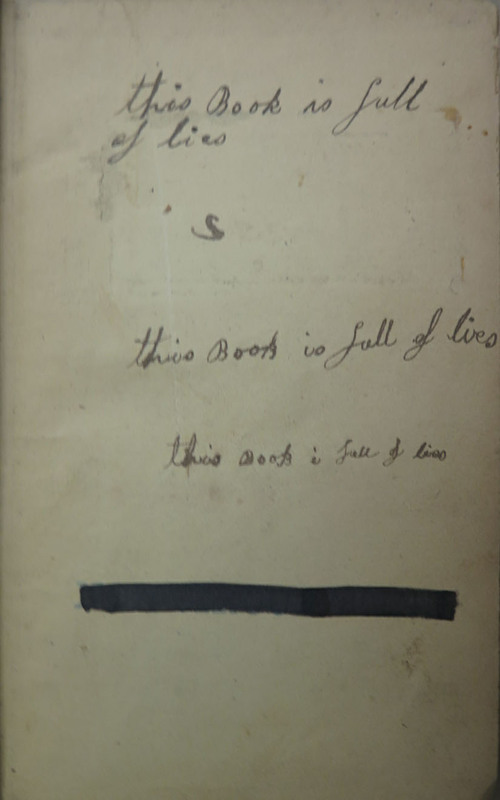 The images above demonstrate that the student had a far more strident response to the American Tract Society that simply, “This book is full of lies.” He elaborates that, “This little book is one of infamous lies,” and “such books…are used to poison…young minds.” The cursive is difficult to decipher, but the student’s primary concern seems to be that The Spirit of Popery provides a dishonest interpretation of Roman Catholic dogma. 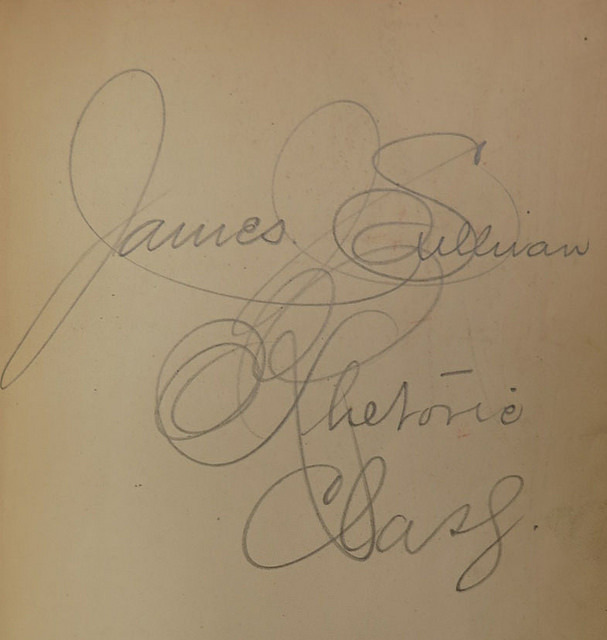 In addition to summarizing his grievances with the work opposite the title page, the student also inscribed footnotes throughout to pinpoint his criticisms. Some footnotes seem rather superficially heated. On page 242, for example, the author quotes Genesis 48:15-16: “The God which fed me all my life long unto this day, the Angel which redeemed me from all evil, bless the lads.” The student places a strike through the word “which” and replaces it with “who.” The quotation, of course, comes from a King James translation of the Bible. Thus, the student was presumably so offended by his Protestant adversary’s choice of scriptural source material that he felt it necessary to correct its grammar. Other annotations are more theologically intuitive. On page 261, the author argues, “Purgatory, like many parts of the Romish system, is derived from heathenism.” The student retorts, “This is false. The dogma is derived from the Bible.” Regarding more earthly matters, the author criticizes the Roman Catholic belief in transubstantiation during the Eucharist. On page 206, he asserts that when Jesus spoke of bread becoming His body and wine becoming His blood at the Last Supper, “The mode of speaking thus common, is peculiarly so to the Syriac tongue, in which our Lord most probably conversed with his disciples, and to other eastern languages, which have no term expressive of ‘to signify’ or ‘represent,’ according to our sense of the word.” The student counters that it is “a pure falsehood” that “eastern languages” lacked the capacity to convey metaphor. The student provides longer, more elaborate-looking explanations in other chapters, but after more than a century the ink in these areas has bled enough to render what were likely even most concise criticisms illegible. It is fascinating to uncover a work so antagonistic towards Catholics in Chicago’s first Catholic college library. Furthermore, it is not the only book of its kind. There is second book published by the American Tract Society listed in the library catalog called Infidelity. What can we conclude from this? Perhaps Jesuit educators believed that if students were to develop the skills necessary to defend their spiritual identities in a secular world, then they should not be insulated from evangelical criticisms widely available in the American print marketplace. For more on the American Tract Society, I would recommend two articles by David Paul Nord. First, “Systematic Benevolence: Religious Publishing and the Marketplace in Early Nineteenth-Century America” from the anthology Communication and Change in American Religious History (1993). Second, “Religious Reading and Readers in Antebellum America” from the Journal of the Early Republic, vol. 15, no. 2 (1995). The Democratization of American Christianity by Nathan O. Hatch provides an excellent overview of American Christianity’s relationship with the print marketplace. This copy is currently held in the Special Collections of the Elizabeth M. Cudahy Memorial Library. Classicists are most assuredly familiar with Quintus Horatius Flaccus, the Roman lyric poet known to anglophones as Horace. His ancient works were frequently translated into English throughout the eighteenth century, and several poetical and prose interpretations found new homes in the nineteenth-century library at St. Ignatius College. Samuel Johnson celebrated the transliterating prowess of Rev. Philip Francis in particular as the finest of his generation. He said succinctly, “The lyrical part of Horace never can be perfectly translated;…Francis has done it the best.” Chicago’s Jesuit educators must have concurred to some degree. In the coming week, we will be featuring not one, but two editions of Francis’s work noted in Loyola University Chicago’s first library catalogue. The subject of the present posting, though, is a blank verse version of Horace by William Duncombe. 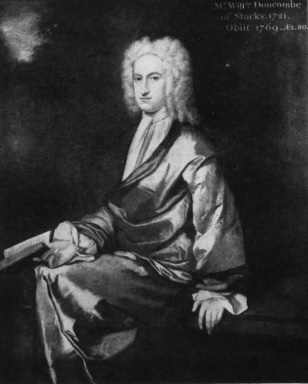 Duncombe’s first recorded translation of Horace dates back to 1715, but it was not until 1757 that he began releasing his most comprehensive English collection. The 1767 publication in our possession is a second edition of this vernacular compilation. 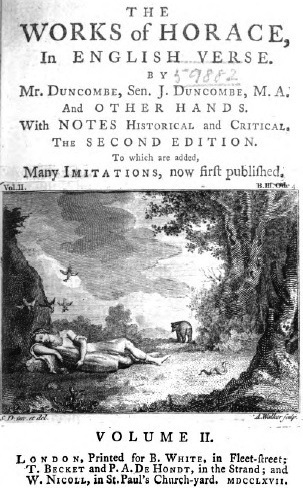 The publishing information reveals that Duncombe did not undertake this update alone. He called upon the assistance of his only son, John Duncombe, a notable British author in his own right. 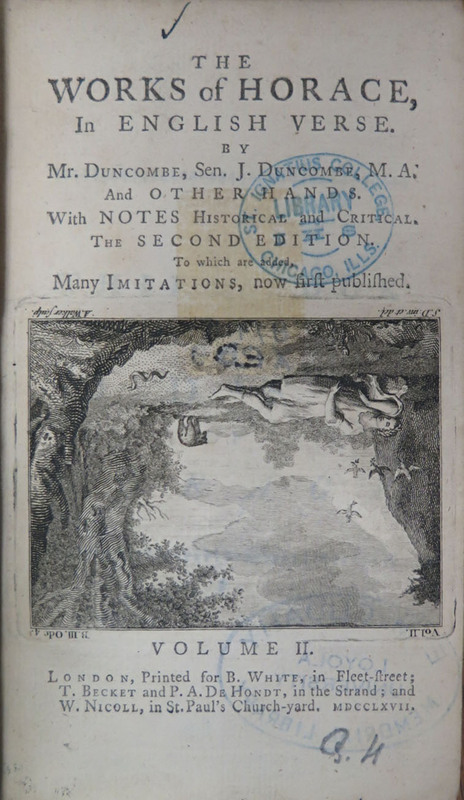 While the new four-volume set advertised having “Many Imitations, now first published,” its most distinct aesthetic additions were illustrations for each title page. We have amassed samples of the second volume from several other institutions such as the British Library (left) and the University of Michigan (below). Notice anything? Their opening images are right-side up! This demonstrates that our copy’s printing error – the upside down image – was not ubiquitous to the run of the publication. It is likely that Fleet Street printers caught their initial mistake early enough to properly reposition the image’s engraving for subsequent reproductions. However, this did not seem to prevent already erroneous editions from escaping into the market, giving Loyola University Chicago a true literary treasure. It is also compelling to consider that English-speaking consumers had a second new translation of Horace to choose from in 1767. 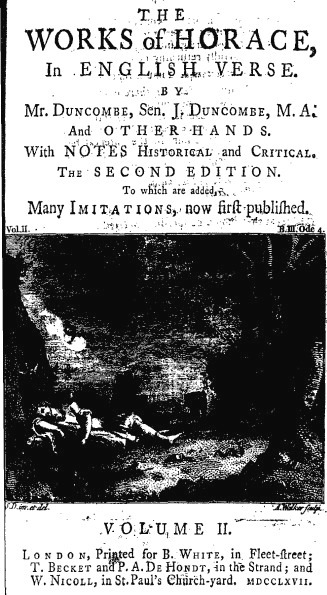 Christopher Smart completed his own four-volume series that year which he specifically targeted to students. Like Duncombe, Smart was well experienced in translating Horace. He penned a prose compilation in 1756 that classicist Allen R. Benham claimed was the most widely used translation of Horace in that era. Still, Benham harshly criticized this work as “frankly a ‘pony’ or ‘trot,’ a help to school boys struggling with their Horace.” Was Smart’s 1767 revision just as juvenile? Dr. Leah Orr argues not. She attests that Smart was similarly dissatisfied with his earlier interpretation and attempted to both improve upon his original work and Christianize Horace’s Latin text in his later publication. Nevertheless, St. Ignatius College’s librarians opted to order Duncombe’s translation rather than Smart’s. Perhaps the former offered a greater quality and aesthetic appeal that Jesuit educators were seeking at the time. This past November, Jesuit Libraries Provenance Project (JLPP) Director, Dr. Kyle Roberts, received an e-mail from Carolyn Sharp, a descendent of John Gordon Morrison, the Union soldier who looted a copy of the Lives of the Popes from the house of Rev. James A. Harrold, a Virginia minister went over to the Confederate side during the American Civil War. 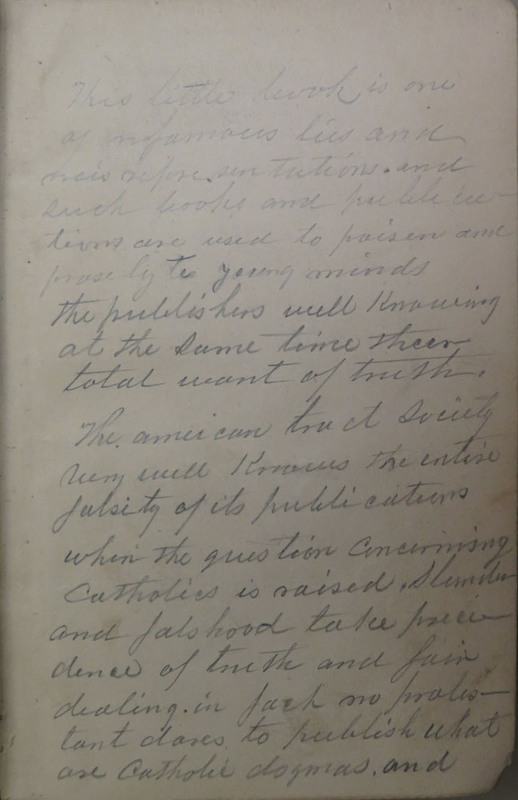 The book, one of the original books in St. Ignatius College Library, was written up on this blog last spring and now resides in Loyola University Chicago Special Collections. She also shared information about other family members who had been educated at Jesuit schools. This connection provides another invaluable information as we seek to solve the puzzle of the history of this book. E-mails and correspondences like these highlight an important part of JLPP. Team members embrace a concept popular in public history circles called “shared authority,” or doing history alongside and with the communities involved. The term shared authority gained ground among oral historians, most notably Michael Frisch, who in his research worked with people and their histories. Thus, shared authority pushes against the “master narratives” or histories about “great men,” as it focuses on the experiences and voices of every day people. JLPP team members rely on experiences, insights, and narratives from various communities to best capture the provenance for each book in the original St. Ignatius catalog. In gathering this information the team hopes to write histories of these books that incorporate the voices of all those who have been touched by them. As a digital initiative, the Jesuit Libraries Provenance Project seeks to reach audiences inside and outside Chicago’s and Loyola’s boundaries, and in so doing, the project enters a dialogue with other digital initiatives throughout the world. Yet, do digital initiatives allow for each potential stakeholder to enter into the conversation? As a project team member, enrolled in Loyola’s Public History graduate program, I often think about the communities excluded from the conversation. For example, does everyone associated with Jesuit communities or the global Catholic mission have access to digital resources? And, how digitally literate are individuals in the aforementioned communities? More simply, what does it mean for the project if users in communities the team wants to reach do not have access to technology, and more importantly, social media? Are there ways for the project to reach people without access to social media or social media literacy? JLPP functions on a participatory level. It allows students, faculty, public historians, independent scholars, antiquarians, alumni, and the broader public to learn about and discuss these books’ histories. And, more than that the histories related to Jesuit education in Chicago, the global Catholic mission, libraries, the organization of knowledge…the list goes on! The e-mail Roberts received in November reinforces the role participation and shared authority play in the project’s development. No matter the task, it is necessary for team members to think about how to share the histories at hand and make them accessible to our multiple audiences. Moreover, it is equally important to include and highlight user experiences and histories in the project itself, so as to preserve the multi-vocal histories related to the library’s original catalog. Amongst all the potential categories Jesuit scholars could have chosen when organizing St. Ignatius College’s first library catalogue, they considered the subject of legislation important enough to include within their six final subdivisions. In such a category, there are certainly some paramount pieces that historians would expect to see, perhaps none more than the revolutionary 1215 English charter best known as the Magna Carta. Well, the catalogue does not disappoint. It includes not one copy of the Manga Carta, but two. Moreover, each reprinting of this landmark legislation carries with it a unique story along with enigmatic elements for we modern historians to unravel. The oldest copy of the Magna Carta in the first library catalogue is entitled Magna Carta in F and was published in 1529 by an English printer named Robert Redman. Historians of print are most assuredly familiar with Richard Pynson, one of the most pivotal figures in fifteenth and sixteenth century English book making. Well, it was in Redman that Pynson found not only a virulent rival, but also an unlikely successor. According to most sources, Redman followed directly in Pynson’s footsteps working to loosen his monopolistic grip on legal printing. While Pynson originally published an edition of the Magna Carta in 1508, Redman released his own version in 1525. This is, in all likelihood, the version available in Loyola’s library (with only a few additions). 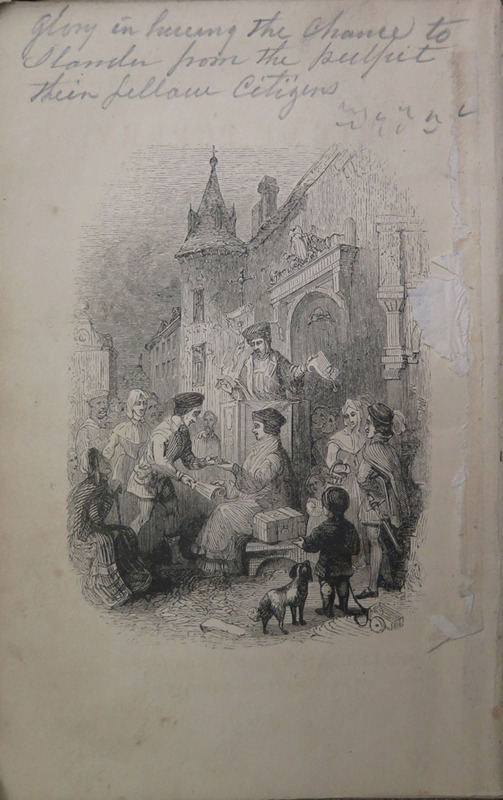 Considering its modest dimensions of 14 cm and subtitle of “Necessarye for all yong studiers of the lawe,” it is perfectly reasonable to infer that this book was meant to be used as an academic supplement. It is also reasonable to assert that this supplement was relatively successful since it would prove to not be Redman’s last foray into printing. He went on to earn the exacerbated ire of Pynson, the latter calling Redman, “more properly Rudeman, because among a thousand men you will not easily find one more unskillful.” Despite Pynson’s obvious indignation, Redman progressed smoothly in his profession. After the old printing master died, Redman assumed control of his Fleet Street offices and machinery. It is indeed from Fleet Street where our Magna Carta in F originates, a product of a bitter competition won, in the end, by Redman. 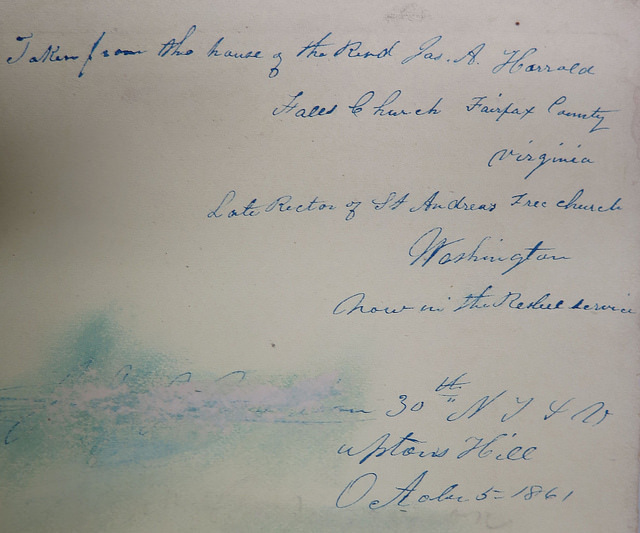 This unidentified inscription continues to confound us here at the Jesuit Libraries Provenance Project. If any fellow historians out there could decipher it or provide some insight into its meaning, it would go far in adding to the great story of this great charter. Speaking of great stories, the second Magna Carta featured in the first library catalogue dates back 1602. 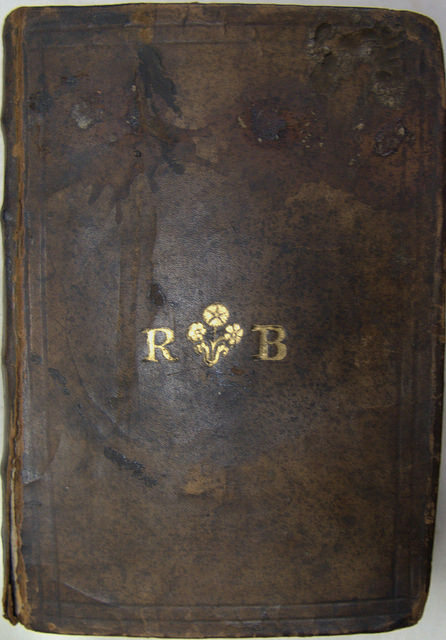 This version’s most prominent feature is its calfskin binding emblazoned with the initials R.B. 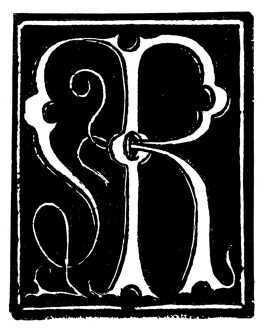 It is quite a remarkable coincidence that with another Magna Carta comes another set of initials beginning with R. As seen above, Richard Pynson monographed all his publications with an R.P. symbol. Redman followed suit using an R.R. symbol in the exact same style. However, since this 1602 text was printed by Englishman Thomas Wright, it is highly unlikely that the R.B. relates to the book’s publication information. According to a source uncovered by Dr. Robert Bucholz (whose own initials are also remarkably coincidental), Wright acquired a patent on common law books in 1589 and it is possible that this edition, much like Redman’s, was intended as an academic supplement. At 15 cm, it is certainly adequately sized for easy transportation, and it is also notable for the presence of underlinings and frequent annotations. So, who exactly was R.B.? Perhaps he was a lawyer or law student who once held this treasured tome in his private collection. At this stage of research, though, that answer is difficult to concretely ascertain. What is clear is that whoever R.B. was, he took great pleasure in this great book now held securely by Loyola University Chicago. – Michael J. Albani, Provenance Project Coordinator. Featuring the much appreciated input of Dr. Robert Bucholz. As Evan Thompson pointed out in a previous post, many of the books in the St. Ignatius College library collection bear a history of ownership that predates the 1870 founding of the college. They have been through several owners, each who has left her or his own mark on the material text in some way, each adding to the book’s story. This was a relatable concept for me. I have a growing personal library, and many of my books are bought second hand from several incredible book stores located throughout Chicago. Often I’m intrigued by the simple scribbling in the margins; other times an airline ticket left as a bookmark, or a handwritten dedication on the title page excites my sense of mystery. And, like most people in their early twenties, I often find myself picking up and moving apartments year after year. My own books go through a lot of packing and unpacking. It always takes longer than packing my other things. After all, these books contain memories: my experiences and the ghosts of previous owners. Some books were bought for class, others received as gifts, and others come from my childhood. Walter Benjamin, the great twentieth-century philosopher, literary critic, and intellectual giant of the Frankfurt School, knew this intimately. His essay, “Unpacking My Library,” found in his collection, Illuminations (English edition, 1968), reflected on his experience of reconnecting with his private library collection. But what about a library collection? The Jesuit Libraries Provenance Project looks to recover a private collection, limited to the use of the Jesuits and their students at St Ignatius, but it is far more ‘public’ than an individual owner. Through our own ‘unpacking’ of this collection nearly one hundred and fifty years later, we are able to learn more about the book’s previous unpackings, and more about the individuals who have opened, read, stamped, torn, and written in the books. A university library, after all, is simply made up of individuals, isn’t it? Benjamin is correct in pointing out that our access to these individuals becomes blurred and dispersed the more communal a work becomes. Benjamin continues, “The acquisition of books is by no means a matter of money or expert knowledge alone…Dates, place names, formats, previous owners, bindings, and the like: all these details must tell him something – not as dry, isolated facts, but as a harmonious whole.” At first thought, this ‘harmonious whole,’ that Benjamin speaks of seems like an impossible utopian goal. But maybe it’s closer than we think. The digital nature of the Provenance Project further complicates Benjamin’s public/private dichotomy. Benjamin was certainly keen on the effect that technology would have on collecting and art, but perhaps even he could not have imagined photographing a library and putting it on the Internet, giving billions of people access. By crowdsourcing parts of the project, we’re able to share what used to be held by only one individual at a time, with people all over the world. Already we’ve seen incredible results and stories. Benjamin argues that ownership over an object, in this instance a book, produces an aura, or ‘little genni,’ around it. The Provenance Project has shown that it isn’t necessarily ownership alone that generates this aura; perhaps it’s also the book’s usage. A book is like a home, filled with locked rooms containing the life of each of its previous owners. 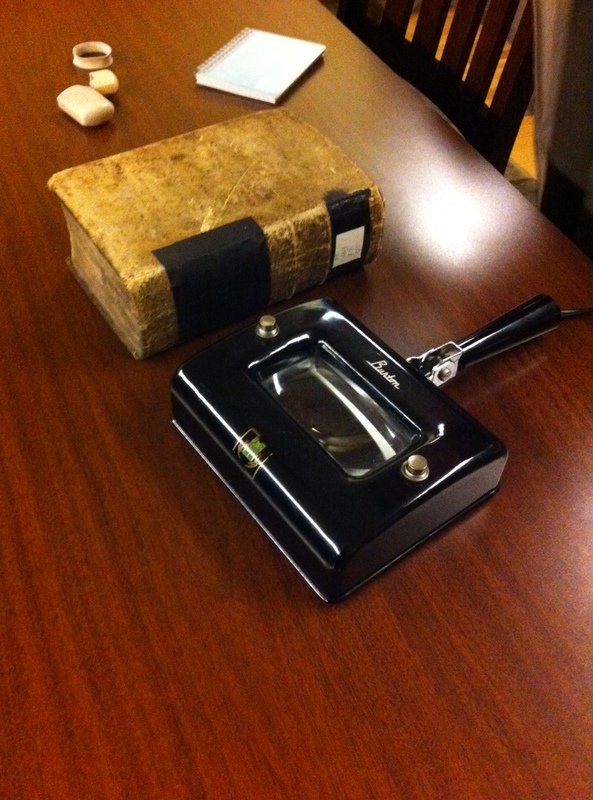 The Provenance Project, while it may never find the ‘harmonious whole,’ of the history of the collection, or even of one book, it hopes to unlock these rooms, and let the lives and stories of individuals and their time using a book meet each other. 1473: The birth of Nicolaus Copernicus. The height of the Aztec Empire in Mexico. 19 years before the voyage of Christopher Columbus under Queen Isabella and King Ferdinand of Spain. The publishing date of the oldest book remaining from the St. Ignatius Library in University Archives and Special Collections at Loyola University Chicago. This volume of Pliny’s Natural History was published in Rome. It is written in Latin. Surrounding the text of the first leaf, and incorporating the initial letter, is an elaborate hand-drawn border, illuminated in gold and colors. About 400 years after its publication, it found its way to the brand new Jesuit library at St. Ignatius College. How did it make its way from Renaissance Rome to Industrial Era Chicago? Only two parts of the book’s past are currently known, but their connections are fascinating. 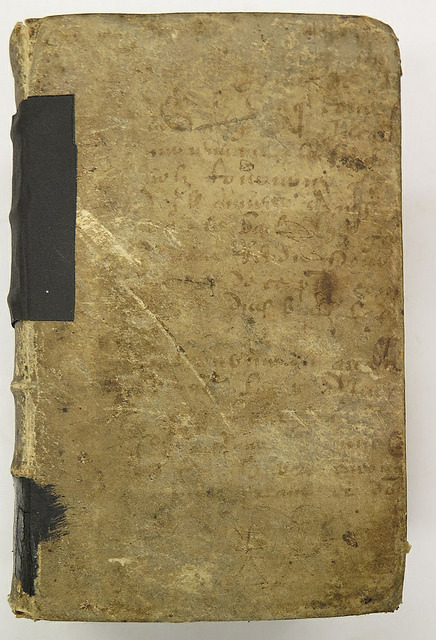 According to the Latin inscription at the beginning of the book, this volume of Pliny belonged to the Dominican Order in Perugia, a city in the Umbria region of Italy. The presence of the book, however, cannot be confirmed for quite some time afterwards. The turmoil the Italian Peninsula faced during the 17th-19th centuries, culminating in the unification as the Kingdom of Italy in 1861, could have led to the book’s departure at any time within the 300 year span. French and Austrian troops had control of the city itself at various points in time, so either could have removed it from the library, or the book could have remained where it was until its movement to England. A bookplate found has the unmistakable crest of the Duke of Sussex. Luckily this title was only ever given to one man, Prince Augustus Frederick, 1st and only Duke of Sussex. He was well known for his extravagant library which he built through the acquisition of individual books rather than whole libraries. The question of how the Duke of Sussex came to obtain this book likely cannot be answered unless a proof of sale/purchase is found. The book may have still been in the care of the Dominicans at Perugia, or it could have found its way to a bookseller in Paris or London where the Duke bought it. Living beyond his means, the Duke was forced to auction off his possessions, including his library, in the 1840’s. Volumes of Pliny are mentioned within the catalog of books for sale. The book only has about thirty years at this point to make its way to the library at St. Ignatius, so its purchase by a book dealer or a different private owner is possible. It might also have been purchased by a Jesuit or someone affiliated with the Jesuit Order who donated the book when the library was being formed. More on the Duke of Sussex’s Library can be found here. Many thanks to Martin Davies for his help with the identifications! The Mystery of the “Looted Civil War Book” – Solved. 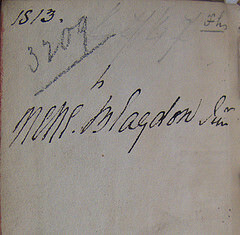 About a month ago we posted on our Flickr site the following inscription found in Loyola’s copy of The Lives of the Popes by Leopold Von Ranke (to view all images from this book click here). The Civil War Diary of John G. (Gordon) Morrison, 30th N.Y.S.V. Thus, thanks to Flickr and the help of a scholar, we are now able to put a name and a photograph to the history of this book! 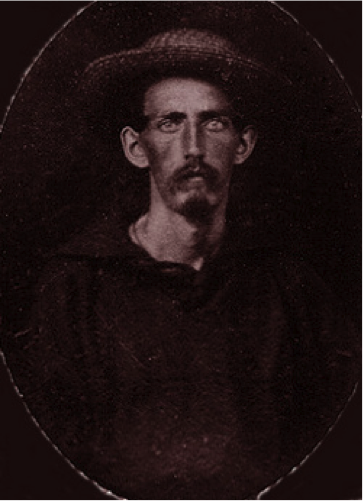 In 1862, Morrison, now serving in the Union Navy, won the Congressional Medal of honor for his bravery and courage when his ship, the U.S.S. Carondelot, came under significant rebel enemy fire. He passed away in 1897 at the age of 58, and was buried in Brooklyn, New York. Only one question remains; how did Morrison’s book make it to St. Ignatius College? 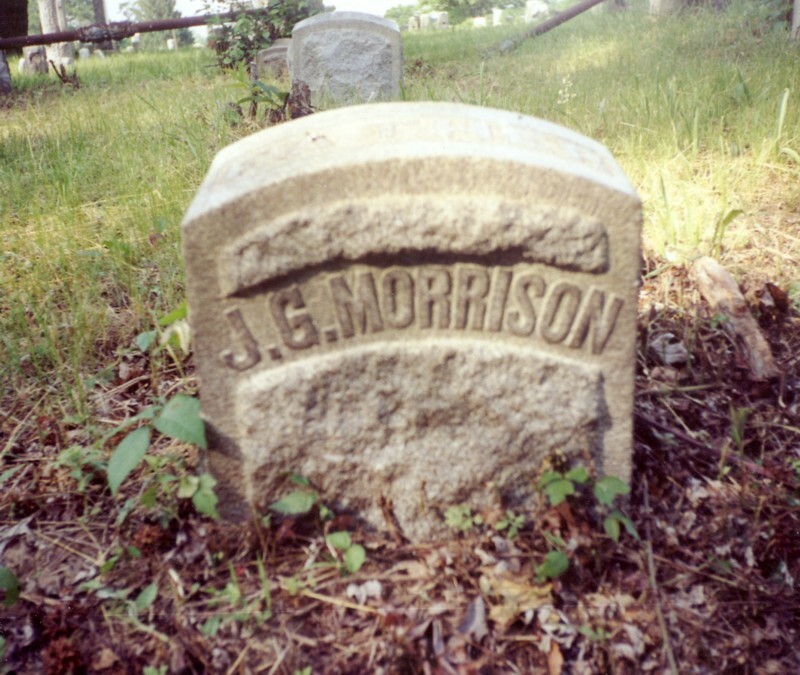 According to the 1860 and 1880 U.S. Census, Morrison lived in New York, and we already know he was buried in Brooklyn in 1897. Additionally, neither his wife or his nine children ever made residence anywhere other than the northeastern United States (most stayed in New York). Wednesday, Jan. 29th, 1862: Was detailed for guard. Had to stay in the guard house when off post, a cold, dirty, cheerless hole. Borrowed a book of Lieut. Campbell to while away the time whilst off duty. Wednesday, Mar. 12th, 1862: Received also a letter and papers from my friend Tom Gillespie which were truly welcome, as I had nothing whatever to read. 1. Morrison might have already mailed the looted volumes home to his wife, but there is no evidence in his very detailed diary of doing such a thing. 2. Morrison might have lost the volumes. Once again, we have no evidence of this in his diary, but this could explain his name being “smudged” out of the book. 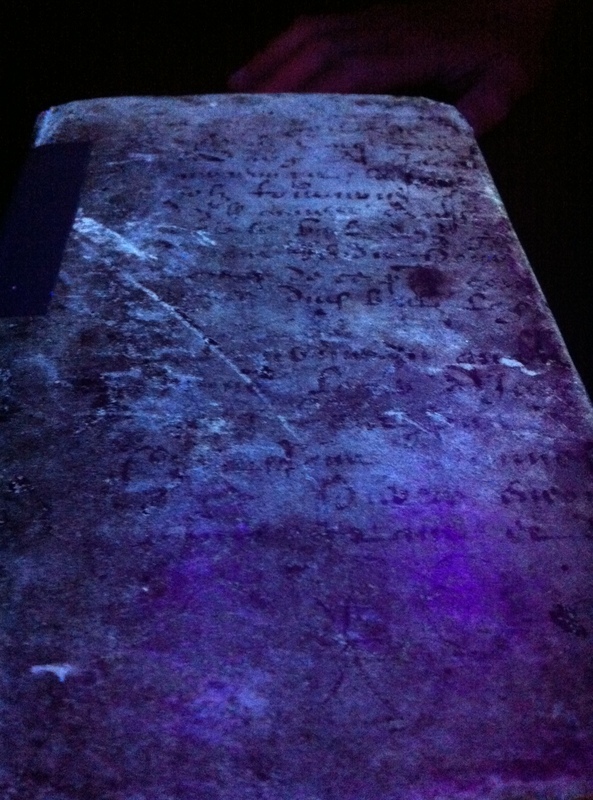 A scholar who visited our Flickr site was able to identify this as a durable parchment, possibly vellum or animal skin. What’s more, the cursive markings seem to indicate that what we have here is a Gothic Latin manuscript cover from the 13th to 15th century! UPDATED: The cover represents a re-used material, because the book that it binds is an 1807 French-Greek dictionary. The reuse of materials in the binding process was not all that unusual, as we have seen with our discoveries with binding waste. It is possible that the parchment used was dyed a darker color to cover over the manuscript writing and it has faded with time, or because the book was so utilitarian — a dictionary — and not a status object, they might not even have bothered. 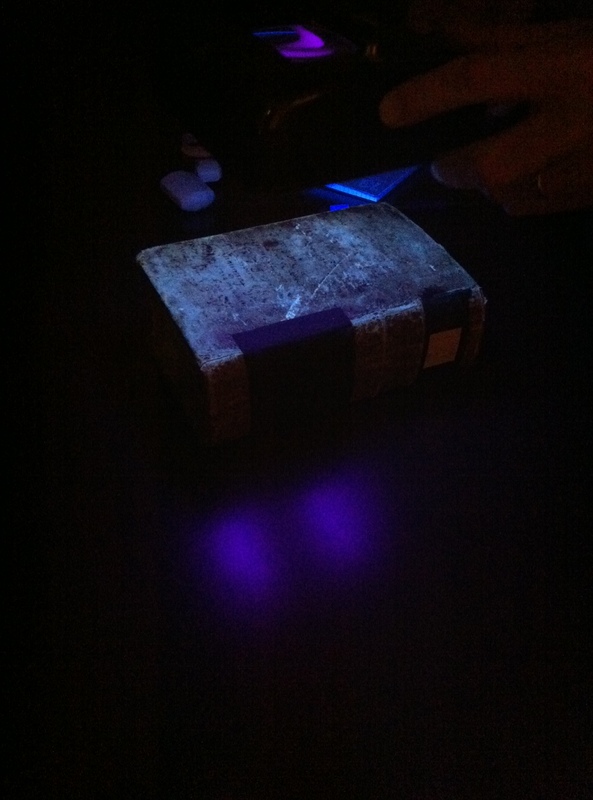 This week, Kyle Roberts of Loyola’s History Department and Edward Wheatley of the English Department took the book down to the Loyola University Museum of Art (LUMA) to look at the covers under UV light. The words on the front cover began to pop from the page! While we were able to begin to make out letters and words, neither of us were able to make complete meaning from the writings on the page. The JLPP has been in touch with Jeff Rydberg-Cox at University Missouri-Kansas City to see if he might be interested in looking at the book with the equipment he has for enhancing the faded writing. Stay tuned for more exciting updates! We have brand new photographs up on Flickr that we need YOUR help identifying! Know what it is? Click on the photograph which will take you to our Flickr site and use the commenting function to give us your two cents! CLICK HERE to help us identify all of our unidentified inscriptions! What we can at least assume is this: this book was looted from a reverend (who joined the confederate cause) by a union soldier from the 30th New York Regiment. What we do not know is why the soldier’s name is smudged out in the lower left hand corner, or how it got to St. Ignatius College. Stay tuned next week for a brand new set of photographs. Until then, please help us identify these inscriptions!